I am SOOO excited to be a Guest Designer for the next 3 months over at SparkleNSprinkle! I can't wait to share my creations with you and am honored to be among such a great design team! 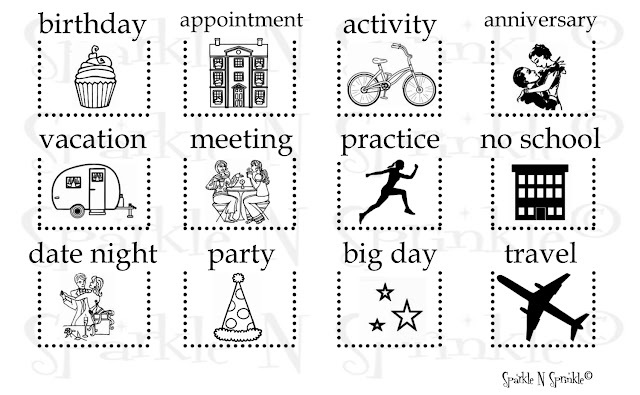 We have SIX new stamp sets to share with you today. These new sets are 20% off until Oct 3. So once you finish the blog hop, head on over to the store and start shopping. All of the new sets are available on cling mounted rubber or as a digital image. 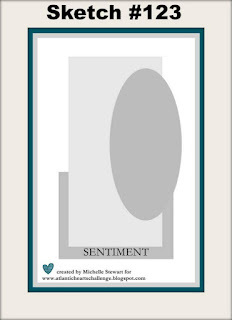 On Oct 3, one GRAND PRIZE WINNER will be selected from the comments left on the Designers' blogs. Please leave a comment with each Designer in order to be eligible for the Grand Prize. You never know who the Mystery Designer will be that has the winning comment. The Grand Prize Winner, which will be announced on Oct 3 on the SNS Facebook page and on the SNS Blog, will receive ALL of the new stamp sets released this month (or the digi versions, if preferred). In addition to our regular Designers, we are happy to introduce you to two new Guest Designers this month. 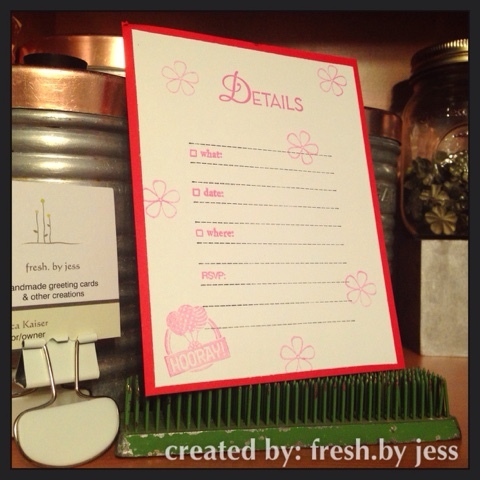 Irit and Jess will be our Guest Designers for the months of October, November, and December. We'd also like to say Thank You to our second set of Guest Designers, Ani and Chris, for a job well done! The latest Mystery Designer was Shona. Wonder who will be the Mystery Designer this month?? 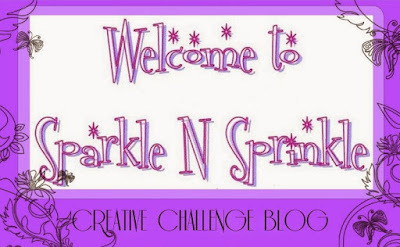 I am so excited to be a Guest Designer for the next 3 months with SparkleNSprinkle! 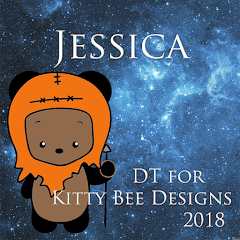 I have tons of ideas to work on, so I hope you love my projects! First up, my reveal project! With Halloween just around the corner, I chose to work with “Cackle On” (743). 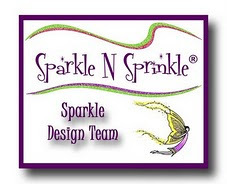 I will list all SparkleNSprinkle products used at the end of my post for easy access. On to my project! First up, I took Hyacinth Cardstock and cut to 4”X5.25”. I inked up my Spiderweb embossing folder with Versamark ink, inserted my cut piece of cardstock and ran it through my Big Shot. 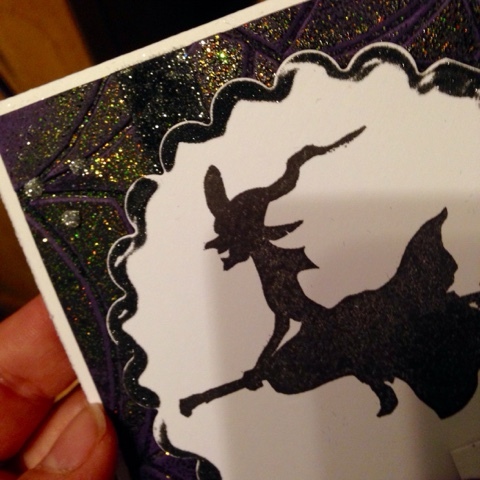 Next, I took my Black Magic Embossing Powder, covered the entire embossed cardstock, tapped off the excess and heat set. Doesn’t that look cool? I took a strip of Tear-ific ½” Tape and added it across the side of the cardstock. I removed the backing and added Night Sky SparkleNSoft. Next, I took Dimensional Glue and added some dots randomly over the corners. 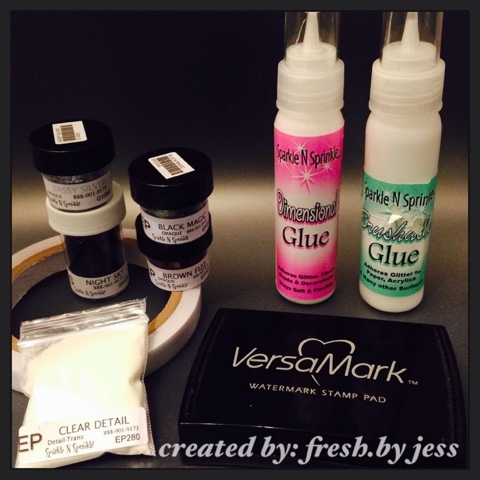 I added Sassy Silver Glitter to each glue dot for embellishment. Love this technique! I set the piece aside to dry while I worked on my main image. 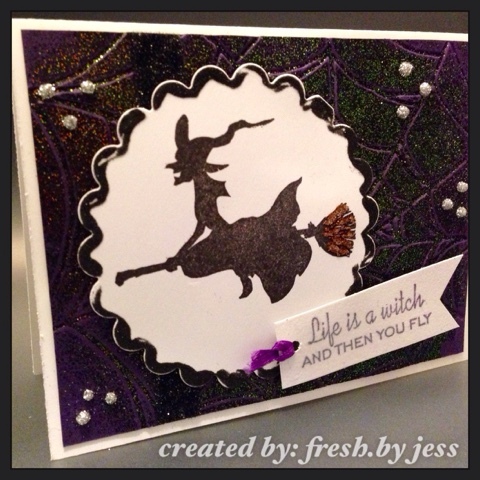 I stamped the Witch image from the Cackle On stamp set using black ink. 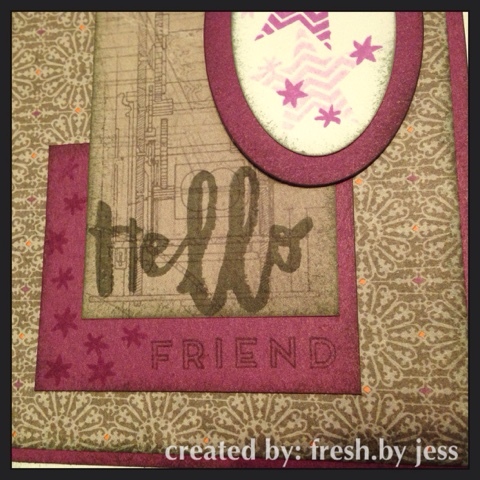 I used my Big Shot and Spell-Binders scallop circle die to cut out the image. Then I took some Dimensional Glue and added some highlights of the broom for emphasis. 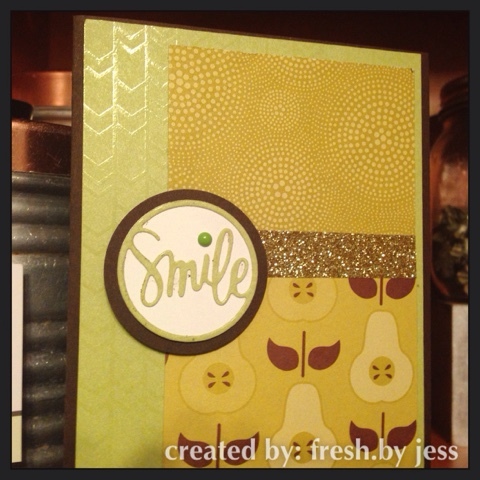 I sprinkled some Brown Fizz Embossing Powder over it and heat set. It makes a cool “puffy paint” effect! I used Brushable Glue around the edges of the scallops and added Black Suede Velvet Glitter to the glue for a little added sparkle. For the sentiment, I stamped it on a piece of white cardstock and dovetailed the ends with scissors. I used Versamark over the entire piece, sprinkled Clear Detail Embossing Powder over it and heat set for a shiny effect. Then, I punched a hole in the end & added a small piece of purple ribbon for decoration. To assemble the card, I used Tear-ific Tape to adhere the purple cardstock to my white cardbase. 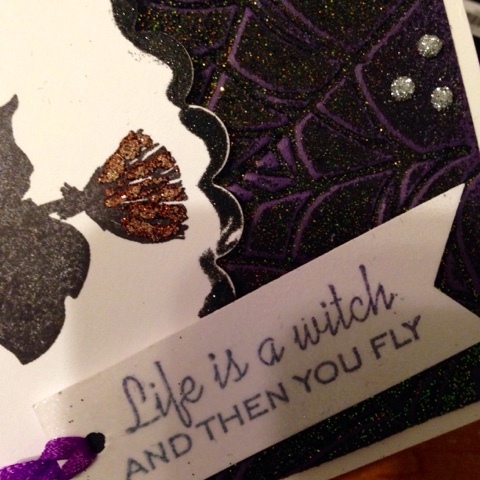 Then, I used Foam Squares to adhere the witch image & sentiment. 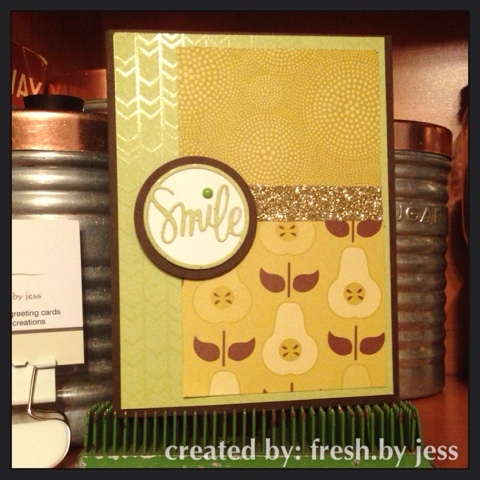 I just loved how this card came together and had a lot of fun creating it. The next stop on our blog hop is Belinda and you can head here to check out her amazing creation! 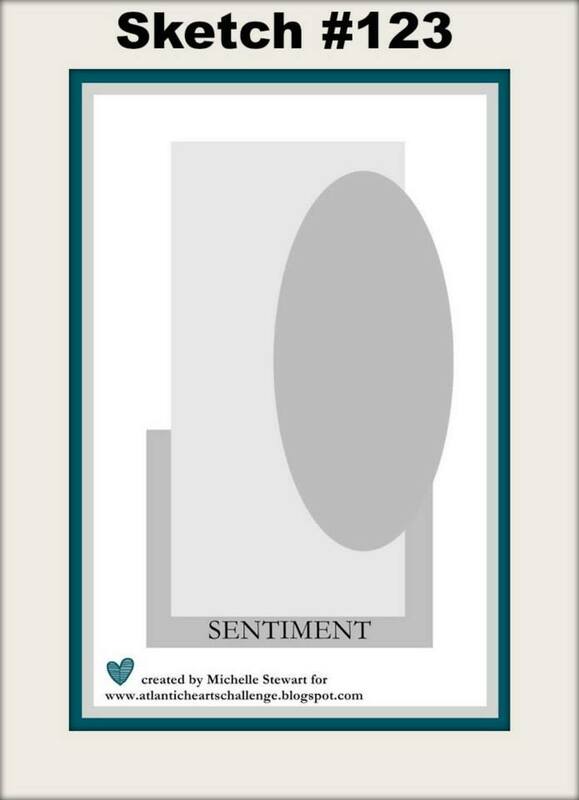 I love to read your comments – they are always so encouraging! Thank you! 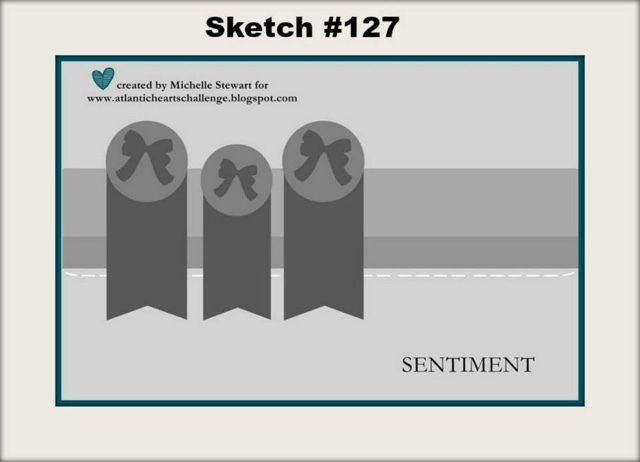 Back again this week with a new sketch from Atlantic Hearts Sketch Challenge! 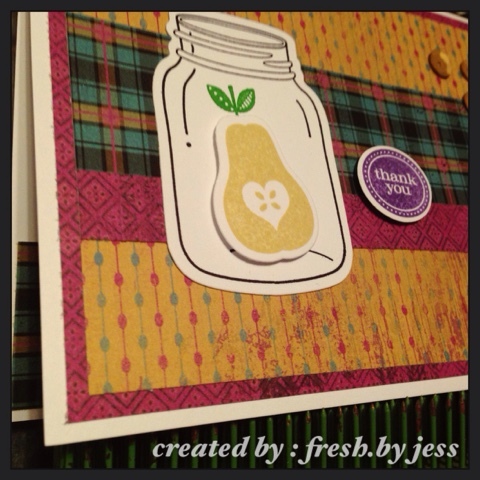 I also used a stampset called "Perfectly Preserved" and Framelit set called "Cannery", both from Stampjn' Up!. 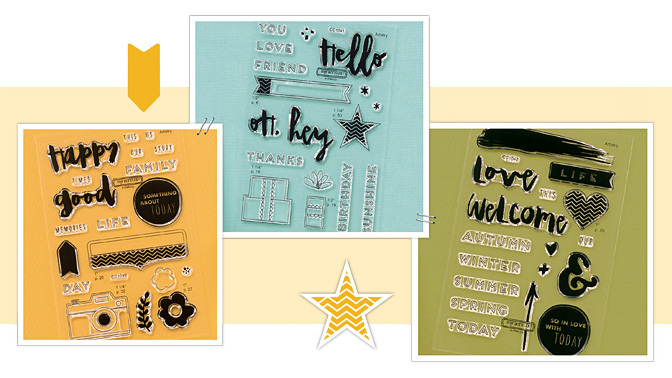 My inks were Flaxen, Gypsy and Black from Close to My Heart and Cucumber Crush from Stampin' Up!. 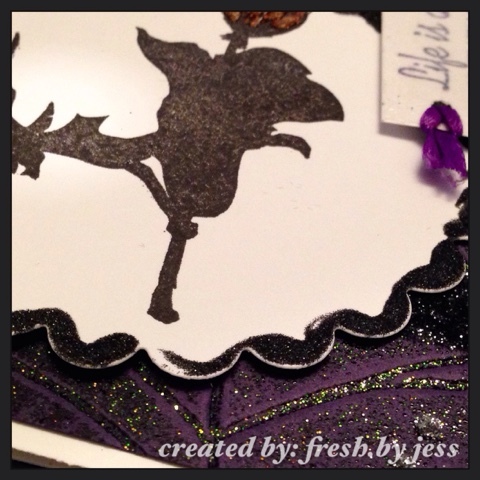 SparkleNSprinkle "Big Day" Special Reveal! Sparkle N Sprinkle is having a Mid-Month Mini Blog Hop so that we can showcase the new Big Day stamp set. 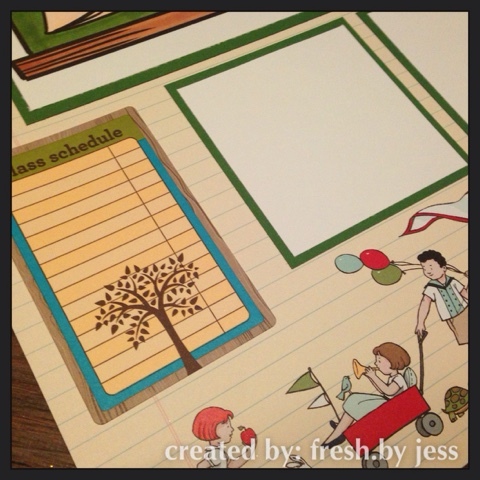 This is a planner/calendar stamp set that was included in this month's video technique kit club. This new set is 20% off until Sept 23. So once you finish the blog hop, head on over to the store and start shopping. A WINNER will be selected from the comments left on the Designers' blogs and will receive this new Big Day set along with the Basic Grey calendar also showcased in this month's video. Please leave a comment with each Designer in order to be eligible for this Prize. You never know who the Mystery Designer will be that has the winning comment. The Grand Prize Winner, will be announced on Sept 23 on the SNS Facebook page and on the SNS Blog. 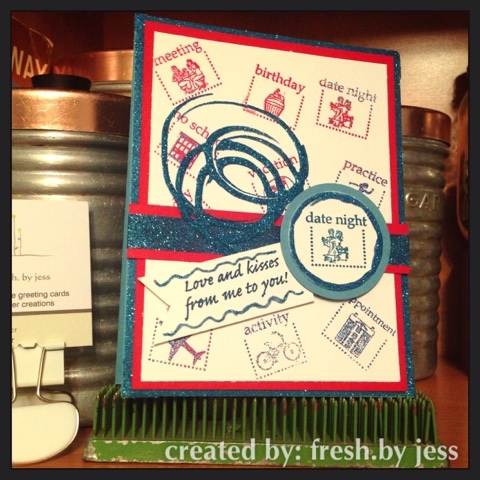 I decided to make a "Date Night" card for my hubby using this stamp! It seemed perfect! I made my background by arranging all the individual stamps on a large block in a random pattern. 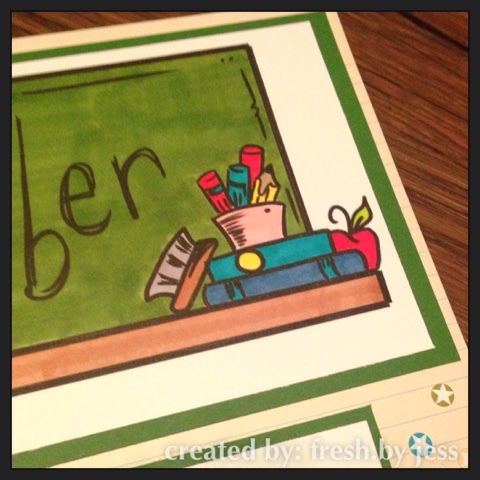 I stamped with Versamark onto a piece of white cardstock. 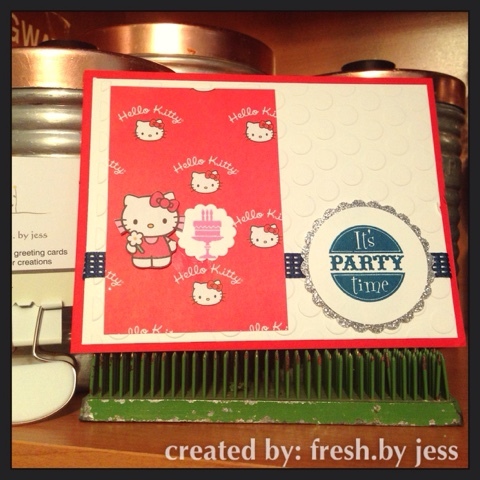 Then, I randomly sprinkled Red Apple Embossing Powder & Americana Embossing Powder over it and heat set. I also put a strip of Tearific Tape on a small strip of red paper to make the accent for the font. I used the same Jasper Blue glitter to make it pop as well! 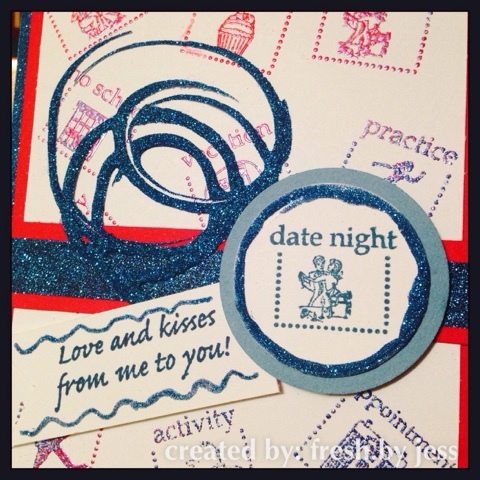 I took the Date Night stamp and stamped it with blue ink onto a 1.5" circle. I used Dimensional Glue around the edge and sprinkled Jasper Blue Glitter to make it stand out. I set it aside to dry overnight and then went to work on my embellishment. To make the swirly circle dimensional embellishment, I used a technique that Demo Donna shared with us in her technique of the week video found here: https://www.youtube.com/watch?v=9kT0jukNL5g. I took my Dimensional Glue and made the design on a plastic bag. 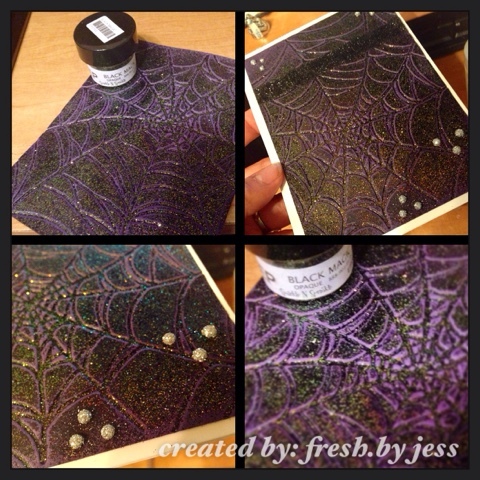 I sprinkled Jasper Glue Glitter over my Dimensional glue pattern, then set it aside to dry. How simple is that? 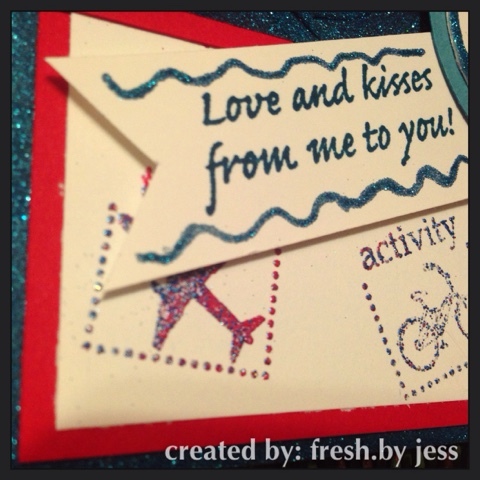 I wanted to add an extra sentiment to the card, so I grabbed my Love & Kisses stamp sent and stamped my sentiment on white cardstock. I dovetail trimmed the edges and used the Sakura Glue Pen & Jasper Blue Glitter to add the swirls on top & underneath the sentiment. To assemble the card, I used Tear-ific Tape & Foam Sqaures for added dimension. I used a few drops of Dimensional Glue to adhere my sparkly swirl embellishment. I hope you enjoy my creation as I sure had fun creating it! 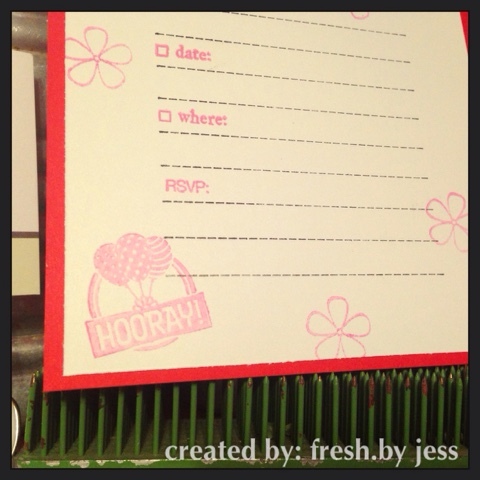 I love that I can use a planner stamp to make a fantastic card - who knew? 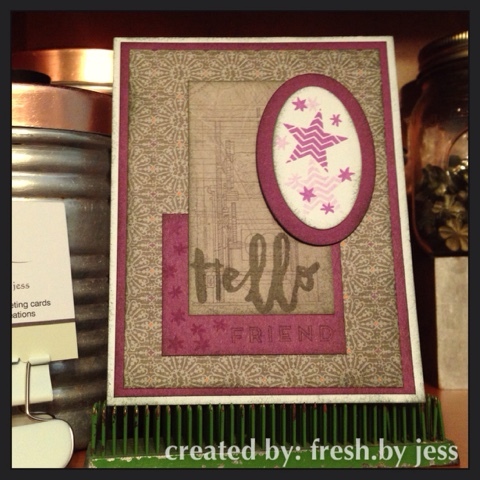 The next stop on our blog hop is Chris and you can find her blog here. 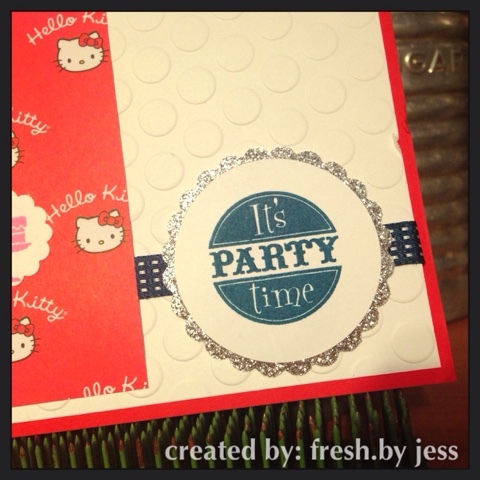 Creative Corner Challenges - Party Time! This week it's time to party over at Creative Corner Challenges! We didn't have a sponsor this week, so we were free to create as we pleased! All of our creations had the theme of Party Time! Isn't it a cute party invite? Fun! It's time for our weekly sketch from Atlantic Hearts Sketch Challenge! My supplies were still mostly packed away from my scrap poking retreat day, so I played with the scraps on my desk! 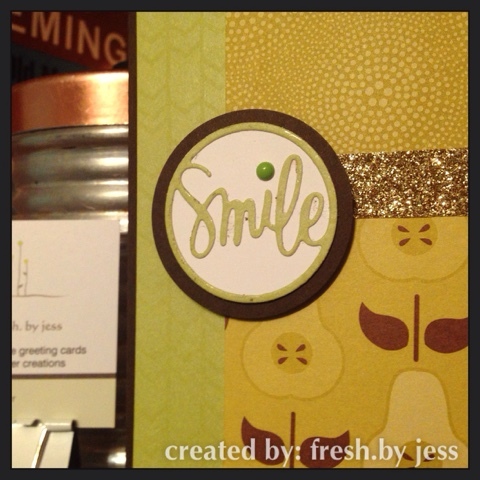 I used a cute "smile" die from Simon Says Stamp. Isn't it sweet? The background paper has a light embossed pattern. You can see it slightly reflected above. I do hope you will come along and play this week! Sorry for the short delay with today's Creative Corner Challenges post - I had some technical difficulties! BUT, I'm good now! This week we were given some wonderful digis from Bugaboo Digi Stamps. 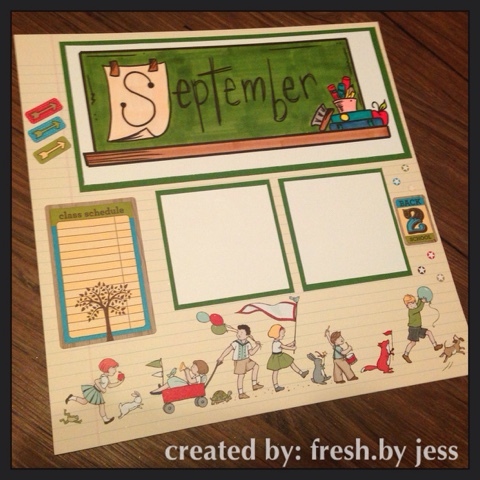 Our theme is "Back to School" - which is perfect! My girls just started back this week. I decided to do a scrapbook layout! It was really plain and simple, but perfect for showcasing those back to school outfits (I'm just waiting for the pictures to arrive from Foxgram.com and then I will add them!). The photo mats are ready for my 3x3 prints. I used some stickers & paper from retired Stampin' Up! supplies. The digi was the September banner. I printed it off large and colored with ShinHan Twin Touch markers. It was the perfect title! I will have a card to share with you next week with another Bugaboo digi. I do hope you will come out and play along. 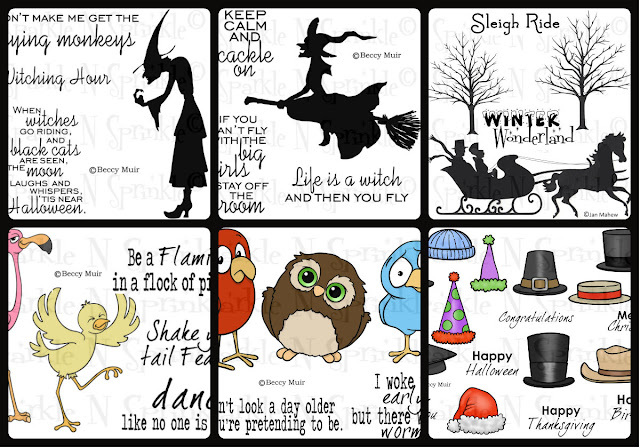 You could win a fab prize from Bugaboo Digi Stamps! I'm back again this week with another fun creation over at Atlantic Hearts Sketch Challenge! I used the brand new "Nevermore" paper pack from Close to My Heart! I wanted to show how you can use it for things other than Halloween. 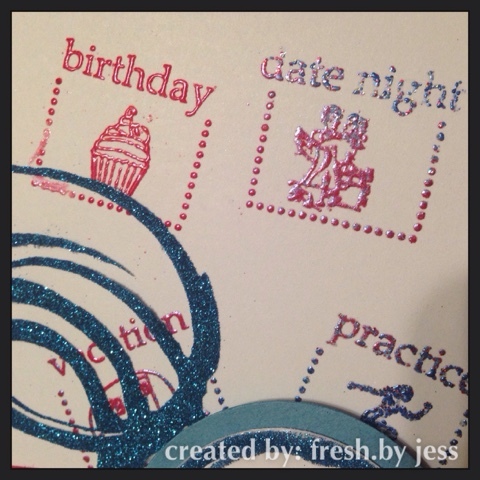 I also used a brand new stamp set - only available this month! It's for National Stamping Month. I used the Hello, Life! 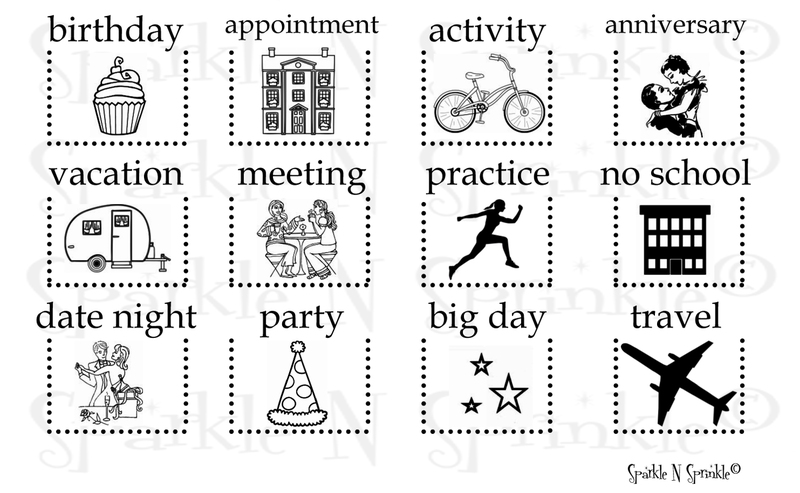 Cardmaking stamp set - isn't it cute? There are three to chose from, or purchase all 3 to get a great discount. 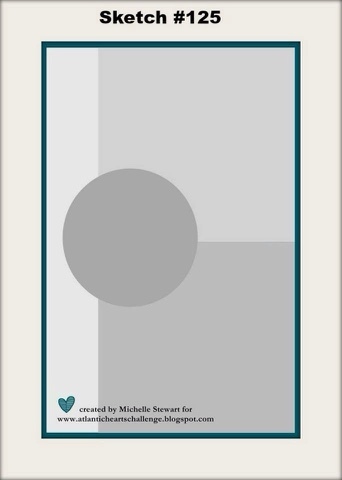 Available only during the month of September, these exclusive C-size My Acrylix®Hello, Life! stamp sets can be purchased for $16.50 CAD each! Or, for an even better deal, you can purchase all three for only $41.50 CAD—a savings of $8 CAD! Contact me to get yours this month only! You can see all that's new online here: www.jessicakaiser.ctmh.com . Interested in hosting a home gathering or attending a class? Let me know!